Pain is the most common reason for seeking medical interventions. It is a major symptom in many medical conditions and can interfere with the quality of life and general functioning of any living being. Natural products are believed to be important sources of new chemical substances with diverse potential for therapeutic efficacies. Taking into account that the most important analgesic prototypes (such as salicylic acid and morphine) were originally derived from plant sources, the study of natural products with analgesic and anti-inflammatory properties is a fruitful research strategy in search of new analgesic and anti-inflammatory agents. Resveratrol (RSV) (3, 5, 4-trihydroxystilbene) is a natural polyphenol that protects against cancer, promote longevity, and cardiovascular diseases. It has been widely investigated for its therapeutic effects in cancer prevention, cardiovascular protection, and anti-aging. It is a naturally occurring phytoalexin present in grapes and wine. RSV is naturally synthesized in plants as a defense mechanism to protect against invading fungi. RSV has been reported to protect the endothelium from oxidative free radical damage, in addition, it helps to protect the production of nitric oxide and the critical chemical produced by the endothelium that keeps blood vessels optimally dilated., Numerous studies have demonstrated protective properties of RSV against inflammation, cardiovascular disease, cancer, and aging.,, As such, it has gained a reputation of being an elixir in red wine and is a popular nutritional supplement and ingredient in over-the-counter skin care products. Resveratrol attenuates neuropathic pain through balancing pro-inflammatory and anti-inflammatory cytokines release in mice. RSV has been shown to be able to induce apoptotic cell death and inhibits the cyclooxygenase (COX) cascade also inhibits the activity of COX-2 and suppresses the activation of COX-2 gene expression. Etoricoxib is a selective COX inhibitor. Similar to diclofenac, Etoricoxib is a nonsteroidal anti-inflammatory drug that eases pain and swelling (inflammation) in conditions such as osteoarthritis, rheumatoid, and ankylosing spondylitis. Etoricoxib blocks the effect of COX-2, by inhibiting the synthesis of prostaglandins in the body and the causative agent for pain and inflammation. Several laboratory studies have reported various health benefits of RSV including blocking the production of nuclear factor kappa β (a powerful noxious inflammatory agent), cellular support that improves mental function, cancer suppression by preventing cancer cell replication and enhancing cancer cell death in a variety of laboratory cell culture studies, and muscle health by reducing muscle wasting associated with diabetes and cancer., This study was designed to investigate systemic analgesic and anti-inflammatory potentials of RSV using laboratory Wistar rat models, with a view of revealing a novel approach to clinical pain management. Following institutional ethics approval, the study was conducted in the human physiology research laboratory of the Ahmadu Bello University Zaria. All the animal care and treatment procedure were respected following the guidelines established by the University's committee on animal use and care. Efforts were made to minimize the number of animals used and their sufferings by strictly following the ethical guidelines for investigations of experimental pain in conscious animals as described by Zimmermann. Adult male Wistar rats weighing 100–120 g were used for the experiments. The animals were maintained under normal laboratory conditions of humidity, temperature, and light for 7 days before the commencement of the experiments and allowed access to food and water ad libitum. The animals were divided into seven groups (n = 6) in separate cages and treated orally as follows: distilled water (control); carboxymethylcellulose (CMC); diclofenac (10 mg/kg), etoricoxib (20 mg/kg), RSV (25 mg/kg); RSV (50 mg/kg); and RSV (100 mg/kg). Sixty minutes after treatment, 50 μl of a freshly prepared 2.5% solution of formalin was injected subcutaneously on the plantar surface of the right hind paw of each rat. The rats were placed individually in an observation chamber and monitored after 5 min, and then, at the end of 45 min. The severity of pain response was recorded for each rat based on the following scale according to Dubuisson and Dennis and modified by Nayebi et al. (0) rat walks or stands firmly on the injected paw; (1) the injected paw is favored or partially elevated; (2) the injected paw is clearly lifted off the floor; (3) the rat licks, chew, or shakes the injected paw. Anti-inflammatory activity of RSV was assessed using formalin-induced edema. Fifty microliter of 2.5% solution of formalin was injected into the right hind paw of each rat 1 h after treatment. Paw diameter was measured using a vernier caliper at 30-min interval for the duration of 4 h. Increase in diameter of the injected paw was taken as indicator of paw edema. At the end of the study, animals were sacrificed using chloroform anesthesia and 4–5 ml of blood was collected by cardiac puncture in plain sample bottles. Serum levels of tumor necrosis factor alpha (TNF-α) and interleukin (IL)-2 were measured using commercially available ELISA kits of analytical grades (Genasiabiotech, China), according to the manufacturer's instruction. The concentrations of the TNF-α and IL-2 were evaluated at 450 and 540 nm, respectively. Data obtained from the experiments were pooled and expressed as mean ± standard error of mean. The results were analyzed statistically using one-way analysis of variance (95% confidence interval) and Kruskal–Wallis test was used to analyze nociceptive scores in the formalin test. Values of P < 0.05 were considered to imply statistical significance. 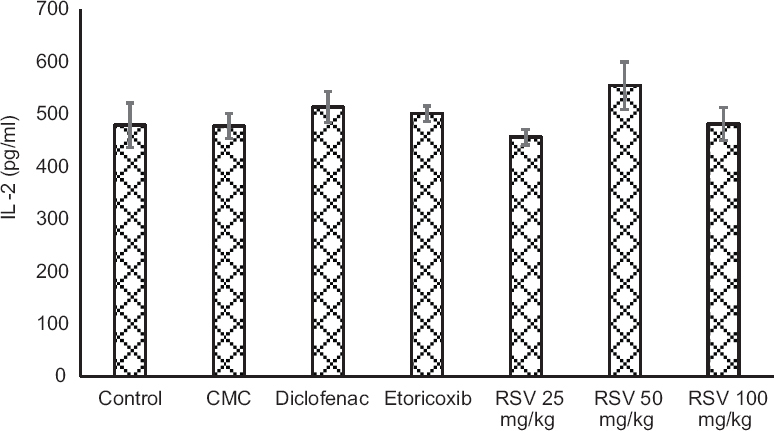 In the formalin-induced nociception test [Figure 1], the results obtained showed RSV (50 mg/kg) to be the most potent in both phases of the formalin tests. There was a significant change in the early phase of the test (P < 0.05), with RSV showing the lowest nociceptive score. In the late phase, there was no significant change in the pain score (P > 0.05), although RSV (50 mk/kg) had a reduced nociceptive score similar to etoricoxib. Formalin-induced paw edema was used to evaluate the anti-inflammatory potential of RSV [Table 1]. RSV (50 mg/kg) and etoricoxib significantly reduced paw edema (P < 0.05) from 30 to 120 min after formalin injection when compared to control, diclofenac, RSV 25, and 100 mg/kg. From this study, the inability of RSV to significantly decrease TNF-α and IL-2 concentrations (P > 0.05) at the dose administered shows that its anti-inflammatory activity may not mediated through the TNF-α and IL-2 mechanisms [Figure 2] and [Figure 3]. Antioxidant activity of polyphenols, including RSV, is closely related to their conformational, electronic, and spectroscopic characteristics. Polyphenols usually pursue their antioxidant activity by reacting with free radicals and donating to them a hydrogen atom or an electron and generating new radical species. 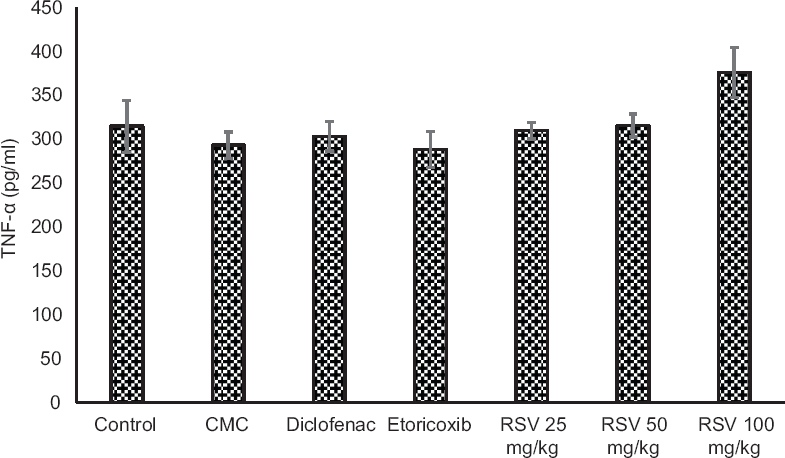 The analgesic and anti-inflammatory effects of RSV and COX inhibitors (diclofenac and etoricoxib) activities were evaluated and compared in an animal model of pain. Formalin test has been validated as an adequate model for the characterization of antinociceptive agents. The formalin test consists of two phases (early and late); the early phase (neurogenic) involves direct stimulation of C-afferent fiber nociceptors. Therefore, agents that possess peripheral analgesic activity will suppress or inhibit this phase while the late phase of the formalin test requires the involvement of inflammatory mediators resulting in central sensitization of the dorsal horn. Agents that possess anti-inflammatory potentials inhibit this phase, and thus, it is used to screen anti-inflammatory and centrally acting agents. 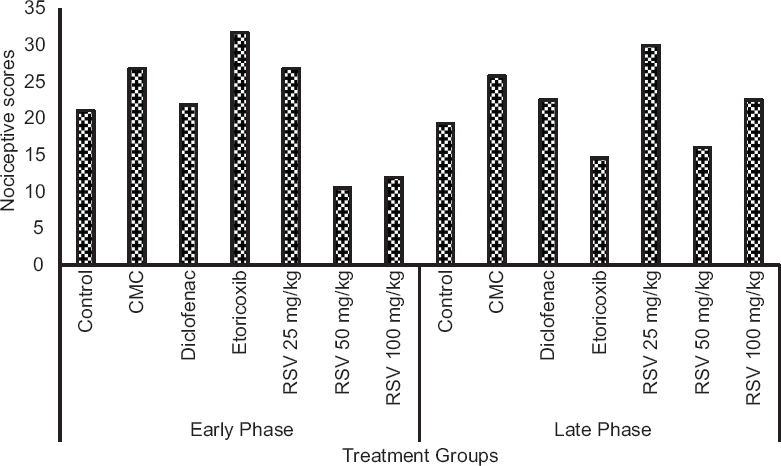 In this study, our results showed that RSV at the oral dose of 50 mk/kg reduced the nociceptive score in the early phase when compared to the other groups. This indicates that RSV exhibited peripherally analgesic potential. This clearly indicates that RSV may have acted peripherally, and may not act centrally since there was no significant difference in the late phase, even though the lowest pain scores were recorded in RSV at 50 mg/kg and etoricoxib. In a similar study by Takehana et al., the mean firing frequency of spinal trigeminal nucleus caudalis wide dynamic range neuron in response to both nonnoxious and noxious mechanical stimuli was inhibited by RSV at 0.5–2 mg/kg, intravenously, suggesting that RSV may be used as a complementary and alternative agent for treatment of trigeminal nociceptive pain. From our result, it may be suggested that RSV (50 mg/kg) had the most potent analgesic effect, compared to the other doses of RSV and had a similar activity to etoricoxib, a selective COX-2 inhibitor. This corresponds to a finding that RSV induced a prolonged antinociceptive effect, which was correlated to the inhibition of COX-2 mRNA increase in dorsal root ganglion. The observed analgesic and anti-inflammatory effect of RSV indicates that there was reduction in the generation of prostaglandins from arachidonic acid, due to possible inhibition of isoform 2 of cyclooxygenase (COX-2), although the selectivity of RSV toward the COX isoforms is still not clearly validated., The results obtained in this study also agrees with the findings of Torres-López who reported that locally administered RSV exerted analgesic activity in early phase and not the late phase of formalin test when compared to diclofenac and celecoxib. Formalin has also been an established model for experimentally inducing edema or inflammation similar to carrageenan. Inflammation by formalin has been demonstrated to be more consistent than carrageenan. Formalin induces inflammation through mechanism that involves generation of inflammatory neuropeptides such as substance P, prostanoids, 5-hydroxytryptamine, bradykinin, histamine, and cytokines which increase vascular permeability resulting in edema.,, RSV has been reported to possibly exert a direct protective anti-inflammatory effect on intestinal epithelium including a change in intestinal permeability. The present study demonstrated that etoricoxib and RSV (50 mg/kg) significantly suppressed edema for 90 min after the injection of formalin. This observed similarity could have occurred possibly because both RSV and etoricoxib exhibits their analgesic and anti-inflammatory activity through the same or similar mechanism of action. However, our result revealed that RSV exhibited more potent analgesia than the COX inhibitors. Pretreatment with RSV has been reported to attenuate carrageenan-induced hyperalgesia but did not reduce swelling; this activity was attributed to its inhibition of COX-2 gene expression. To the best of our knowledge, study such as this has not been reported in Nigeria, or in the West African subregion or Sub-Saharan Africa, hence the need to investigate the analgesic and anti-inflammatory effects of RSV in clinical pain management. A study by Latruffe et al showed that resveratrol can both decrease the secretion of proinflammatory cytokines (e.g., IL-6, IL-8, and TNF-α) and increase the production of anti-inflammatory cytokines; it also decreases the expression of adhesion proteins (e.g., ICAM-1) and leukocyte chemoattractants (e.g., MCP-1). Resveratrol's primary targets appear to be the transcription factors AP-1 and NF-κB, as well as the gene COX2. Resveratrol's broad biological action inhibits COX-2 (cyclooxygenase), TNF (tumor necrosis factor), and CRP (C-reactive protein), all these chemical markers of inflammation that provoke chronic pain syndromes and its demonstrated ability to reduce sensitivity to pain (nociception) should cause clinicians to proclaim resveratrol as the king of pain medication. Anti-inflammatory activity of resveratrol has been widely studied, while its beneficial effect on the management of neuropathic pain, a refractory chronic syndrome with pro-inflammation implicated in, is very little investigated. In conclusion our findings in this rat model suggest that RSV may elicit its analgesic actions by inhibiting direct activation of nociceptors and not through its anti-infl ammatory action. This is because the late phase result could be from inflammatory mediators which correspond to results on IL-2 and TNF-α. It may be suggested that systemic RSV at a dose of 50 mg/kg induces significant analgesic activity comparable to etoricoxib. Thus, systemic RSV may be useful for the management of acute postoperative pain. An understanding of the analgesic and anti-inflammatory potential of RSV is an important future paradigm for pain relief. Additional studies are needed to further delineate the degrees of potency of this agent. Granados-Soto V, Argüelles CF, Ortiz MI. The peripheral antinociceptive effect of resveratrol is associated with activation of potassium channels. Neuropharmacology 2002;43:917-23. Rocha-González HI, Ambriz-Tututi M, Granados-Soto V. Resveratrol: A natural compound with pharmacological potential in neurodegenerative diseases. CNS Neurosci Ther 2008;14:234-47. Mazzone G, Malaj N, Russo N, Toscano M. Density functional study of the antioxidant activity of some recently synthesized resveratrol analogues. Food Chem 2013;141:2017-24. Bradamante S, Barenghi L, Villa A. Cardiovascular protective effects of resveratrol. Cardiovasc Drug Rev 2004;22:169-88. Sinha K, Chaudhary G, Gupta YK. Protective effect of resveratrol against oxidative stress in middle cerebral artery occlusion model of stroke in rats. Life Sci 2002;71:655-65. Valenzano DR, Terzibasi E, Genade T, Cattaneo A, Domenici L, Cellerino A, et al. Resveratrol prolongs lifespan and retards the onset of age-related markers in a short-lived vertebrate. Curr Biol 2006;16:296-300. Tao L, Ding Q, Gao C, Sun X. Resveratrol attenuates neuropathic pain through balancing pro-inflammatory and anti-inflammatory cytokines release in mice. Int Immunopharmacol. 2016;34:165-172. Bhat KP, Kosmeder JW 2nd, Pezzuto JM. Biological effects of resveratrol. Antioxid Redox Signal 2001;3:1041-64. Gan TJ. Diclofenac: An update on its mechanism of action and safety profile. Curr Med Res Opin 2010;26:1715-31. Matsumoto AK, Cavanaugh PF Jr. Etoricoxib. Drugs Today (Barc) 2004;40:395-414. Sharma S, Kulkarni SK, Chopra K. Effect of resveratrol, a polyphenolic phytoalexin, on thermal hyperalgesia in a mouse model of diabetic neuropathic pain. Fundam Clin Pharmacol 2007;21:89-94. Zimmermann M. Ethical guidelines for investigations of experimental pain in conscious animals. Pain 1983;16:109-10. Dubuisson D, Dennis SG. The formalin test: A quantitative study of the analgesic effects of morphine, meperidine, and brain stem stimulation in rats and cats. Pain 1977;4:161-74. Nayebi AR, Hassanpour M, Rezazadeh H. Effect of chronic and acute administration of fluoxetine and its additive effect with morphine on the behavioural response in the formalin test in rats. J Pharm Pharmacol 2001;53:219-25. Hess SM, Milong RC. Inflammation Mechanism and Control. Lepow Ward PA, editor. New York: Academic Press; 1972. p. 1-2. Torres-López JE, Ortiz MI, Castañeda-Hernández G, Alonso-López R, Asomoza-Espinosa R, Granados-Soto V, et al. Comparison of the antinociceptive effect of celecoxib, diclofenac and resveratrol in the formalin test. Life Sci 2002;70:1669-76. Gong NQ, Yuan C, Meng X, Shuai M, Yong-Xiang W. Pain assessment using the rat and mouse formalin tests. Bio Protocol 2014; 4: e1288. Takehana S, Sekiguchi K, Inoue M, Kubota Y, Ito Y, Yui K, et al. Systemic administration of resveratrol suppress the nociceptive neuronal activity of spinal trigeminal nucleus caudalis in rats. Brain Res Bull 2016;120:117-22. Pham-Marcou TA, Beloeil H, Sun X, Gentili M, Yaici D, Benoit G, et al. Antinociceptive effect of resveratrol in carrageenan-evoked hyperalgesia in rats: Prolonged effect related to COX-2 expression impairment. Pain 2008;140:274-83. Szewczuk LM, Forti L, Stivala LA, Penning TM. Resveratrol is a peroxidase-mediated inactivator of COX-1 but not COX-2: A mechanistic approach to the design of COX-1 selective agents. J Biol Chem 2004;279:22727-37. Montiel-Ruiz RM, Granados-Soto V, Garcia-Jimenez S, Reyes-Garcia G, Flores-Murrieta FJ, Deciga-Campos M. Synergistic interaction of diclofenac, benfotiamine, and resveratrol in experimental acute pain. Drug Dev Res 2011;72:397-404. Arzi A, Olapour S, Yaghooti H, Sistani Karampour N. Effect of royal jelly on formalin induced-inflammation in rat hind paw. Jundishapur J Nat Pharm Prod 2015;10:e22466. Goulart AC, Correia FA, Sousa SC, Luz JG. Study of the inflammatory process induced by injection of carrageenan or formalin in the rat temporomandibular joint. Braz Oral Res 2005;19:99-105. Damas J, Liégeois JF. The inflammatory reaction induced by formalin in the rat paw. Naunyn Schmiedebergs Arch Pharmacol 1999;359:220-7. Caio M, Barros O, Rioko K, Sakata TS, Adriana MI, Luis RG, et al. Cytokines and pain. Braz J Anesthesiol 2011;61:255-65. Lima-Rodrigues M, Lamas N, Valle-Fernandes A, Cruz A, Vieira A, Oliveira P, et al. The selective COX-2 inhibitor etoricoxib reduces acute inflammatory markers in a model of neurogenic laryngitis but loses its efficacy with prolonged treatment. Inflamm Res 2010;59:743-53. Ghanim H, Sia CL, Korzeniewski K, Lohano T, Abuaysheh S, Marumganti A, et al. A resveratrol and polyphenol preparation suppresses oxidative and inflammatory stress response to a high-fat, high-carbohydrate meal. J Clin Endocrinol Metab 2011;96:1409-14. Gentilli M, Mazoit JX, Bouaziz H, Fletcher D, Casper RF, Benhamou D, et al. Resveratrol decreases hyperalgesia induced by carrageenan in the rat hind paw. Life Sci 2001;68:1317-21. Rotty J, Heinzerling L, Schurmann D, Suttorp N. Interleukin-2: A potential treatment option for postherpetic neuralgia? Clin Infect Dis 2006;43:e109-10. Subbaramaiah K, Chung WJ, Michaluart P, Telang N, Tanabe T, Inoue H, et al. Resveratrol inhibits cyclooxygenase-2 transcription and activity in phorbol ester-treated human mammary epithelial cells. J Biol Chem 1998;273:21875-82. Pham-Marcou TA, Beloeil H, Sun X, Gentili M, Yaici D, Benoit G, et al. Antinociceptive effect of resveratrol in carrageenan-evoked hyperalgesia in rats: Prolonged effect related to COX-2 expression impairment. Pain, 2008;140: 274-83. Available from: https://doi.org/10.1016/j.pain.2008.08.010. [Last accessed on 2018 Apr 30]. Latruffe N, Lancon A, Frazzi R, Aires V, Delmas D, Michaille JJ, et al. Exploring new ways of regulation by resveratrol involving miRNAs, with emphasis on inflammation. Ann N Y Acad Sci 2015;1:97-106.